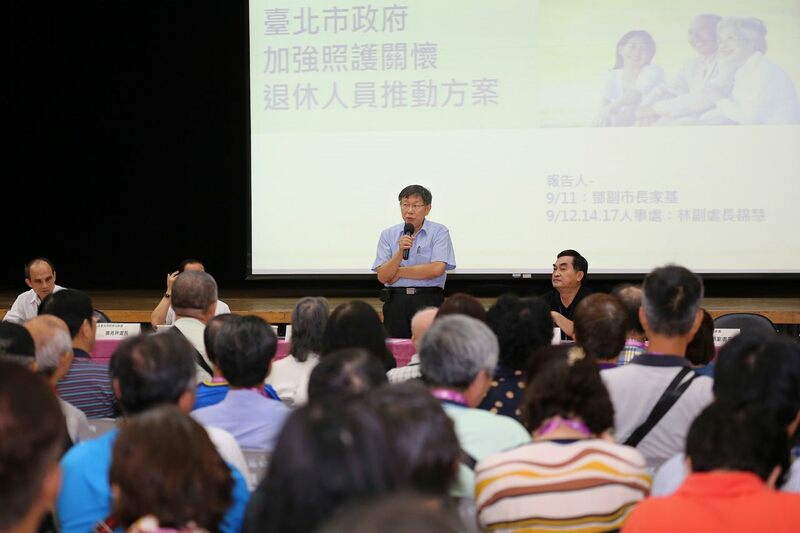 Mayor Ko Wen-je attended the “Taipei City Government Retiree Forum – Care for Retirement Life” event on September 11. He took the opportunity to listen to what civil servant retirees have to say about the impact of pension reform on their lives. During his address, the mayor expressed his support for the direction of the central government’s pension reform plans. However, he personally believes that the reform should have taken place two decades ago and agrees that any adjustments made today cannot please everyone. Overall, he hopes that the city government can come up with a way to help minimize the impact of changes upon the livelihood of retired city employees. Regarding the administration’s plan for taking care of city retirees, Ko pointed out that providing job opportunities is only a part of the overall approach. The offer simply compiles the needs of city hall and will not incur additional costs. The list will be posted on the platform, allowing city hall retired workers to apply online when they have the need. The mayor stressed that the project creates a win-win scenario, allowing the city government to tap upon the experience of veteran civil servants and passing down the knowhow to current staff members. The city government will be holding 6 open hearing sessions to gather opinions and suggestions as well. Ko requested the retired civil servants to ask any questions they have, which will allow the city administration to improve its skills in serving the public. While it may be unrealistic to expect city hall to implement all requests, realizing half of them shouldn’t a problem. By making gradual progress on implementation in the coming years, it should help root out many minor problems.